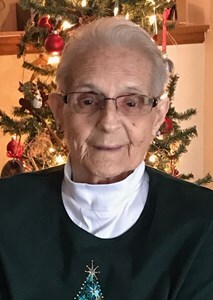 Darlene Rae (Metzger) Maley, 84, Topeka, passed away Thursday, January 31, 2019. She was born November 21, 1934, in Topeka, Kansas, the daughter of Don and Carrie (Peyton) Metzger. She graduated from Topeka High School in 1952. Darlene was employed by Security Benefit as a press operator, retiring after 22 years. Darlene married Tim F. Maley on February 4, 1956 in Topeka. He preceded her in death on July 9, 1992. She was also preceded in death by her siblings, Margie Erickson, Walter Metzger, JoAnne Franks, Mary Paxton and Dean Metzger and niece, Mary Rumsey. Survivors include three daughters, Denise (John) Flowers, Debra Maley (Marge Wolf) and Deanna (Craig) Burkett; sisters, Donna Brandenburgh and Sue Bigham; sister-in-law, Wanda Metzger; two grandchildren, Matt (Jenna) Flowers and Craig Burkett and two great-grandsons, Brecken & Kallan Flowers. Darlene was avid K-State fan, enjoyed sewing, crafts, cooking, her great-grandsons, being outdoors and watching Nat Geo Wild. Funeral services will be 10:30 a.m. Tuesday, February 5, 2019 at Parker-Price Cremations, Funerals & Receptions. Burial will follow at Prairie Home Cemetery. Visitation will be 6:00 p.m.-7:30p.m., Monday, February 4 at the funeral home. Memorial contributions may be made to Midland Care, 200 SW Frazier Cir, Topeka, KS 66606 or Helping Hands Humane Society, 5720 SW 21st St, Topeka, KS 66604. To share a memory of Darlene or leave a message for her family, please click the Share Memories button above. Add your memories to the guest book of Darlene Maley. I'm sorry to hear about your mom, Denise. She was a great lady and loved visiting with her when I used to ride my bicycle by the house and see her sitting on the front porch. Wished I'd known earlier about her passing because I could have had a Card dropped off at the Funeral Home, although, it probably would have been thrown away by your sisters cause they hate the Baileys. One thing I loved about your mom was that she LOVED everybody despite who they were. Maybe I can send a Card to your house for Condolences for your sweet loving mom! Love you, Denise and John Flowers! Will miss your mom. I grew up across the street from the Metzgers. Have many fond memories of Darlene and her sisters and Butch. So enjoyed the video memorial. May you find comfort in good memories. I am so sorry for your loss your mother was a wonderful person she always had a smile on her face and had wonderful times on the bike rides around north Topeka I was so glad to get to meet your mother my prayers and thoughts go out to you and your family at this time RIP Darlene you will be missed ???? My parents went to Darlens parents on Sat. night when I was young .to play cards .Always had fun with the girls . I am so very sorry for your loss. Praying God's blessings and comfort upon all of you. Denise,so sorry.May your God comfort you in the coming days. Sincere sympathy is extended to all of Darlene's family. Many of us worked with Darlene during the 22 years she was a co-worker at Security Benefit. She was part of the Printing Department crew that managed to create sales materials, reports and corporate information while meeting some challenging deadlines. She always had a smile and willingness to lend a helping hand. Thoughts and prayers are with you at this sad time. It was always great seeing you all when shopping at MENARDS. ENJOYED SEEING HER SMILING FACE. The thing I remember most is aunt Darlene and my mom giving all us girls perms. We would take turns setting on the step stool while they worked on else. That was at a house we lived in on Quincy. Denise, John, Matt, Dee & Debbie, my sincere condolences. I always enjoyed visiting with your mom. Peace be with you all.